Did someone steal your bike? Tired of worrying that someone will? We’ve got your solution! Whether you are a Cycling Commuter heading to work or school, a Weekend Adventurer hitting the trails, or a Kid in the Suburbs, you deserve the best protection against thieves. 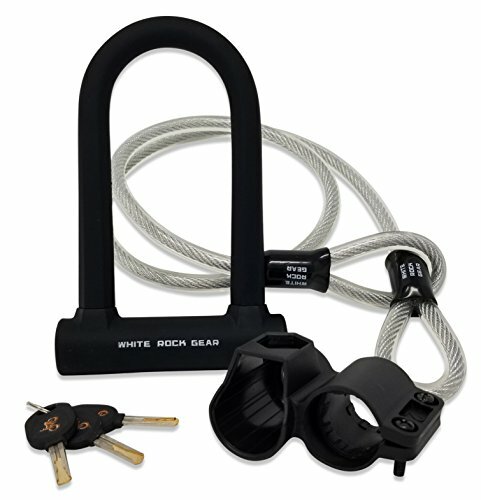 Purchase our Heavy Duty U Lock & Cable for the BEST safeguard when it matters most! Multiple Uses– the lock can be used for other things like; sports equipment, gates, grills, lawnmowers, power tools etc. 100% Satisfaction Guarantee! Our U Lock is backed by our manufacturer 30 day money back guarantee with 1 year free replacement warranty. If you have any questions about this product by White Rock Gear, contact us by completing and submitting the form below. If you are looking for a specif part number, please include it with your message.